Successfully Added Battery Charger with LCD Screen and Rechargeable AA Batteries to your Shopping Cart. Battery Charger with LCD Screen - The easiest way to check the condition of your AA and AAA batteries and keep them fully charged for when you need them. Also includes 4x rechargeable AA batteries to get you started! Extremely simple to use and setup, just place your rechargeable AA or AAA batteries inside the protective case for super fast recharging. The handy LCD screen will indicate charging status as well as each battery's individual power level, so you can use them the second they're done charging. This Battery Charger allows you to charge your batteries through the AC adapter as well as your car's lighter socket and USB charging, so you can charge at home, in the office, or even on the go. The compact size and shape also makes it ideal to use and carry around everywhere. Also includes 4x rechargeable AA batteries to get you started. Like a ruler or of pair of scissors, this Battery Charger with LCD Screen is a tool you might not use everyday but you'll be extra glad you had one laying around when you need it. Available in our warehouse now, order today and we'll express ship it out tomorrow. Brought to you at an unbeatable price from Chinavasion - your best source for high quality, low priced gadgets. 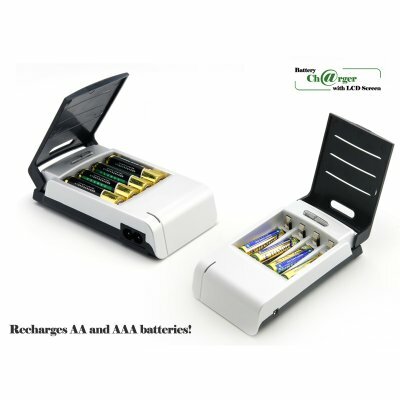 Includes 4x rechargeable AA batteries - FREE! This Battery Charger is designed to work with the included batteries and recharge rechargeable Ni-MH and Ni-Cd batteries only. Please make sure your batteries are able to be recharged before using this product. Can I mix and match charging AA and AAA batteries? on 2012-03-17 14:42:22 Super charger. All fine. Заказ пришел в Белоруссию за 3 недели. Отличная зарядка. Работают все режимы. Каналы раздельные. В комплекте аккумуляторы 2800 mAh. Емкость реальная. Вообщем доволен как слон :). Delivery in 3 week. All working. All as described. Real 2800 mAh battery. Super charger.